Outdoor landscape lighting is often overlooked, but it can have a dramatic affect on a home’s curb appeal and can provide security and extend your entertaining into the evening hours. Outdoor landscape lighting is often overlooked, but it can have a dramatic affect on a home’s curb appeal and can provide security and extend your entertaining into the evening hours. Proper path lighting, up-lighting, and accent and area lighting can showcase a home’s architectural features into the night. Evening entertainment. 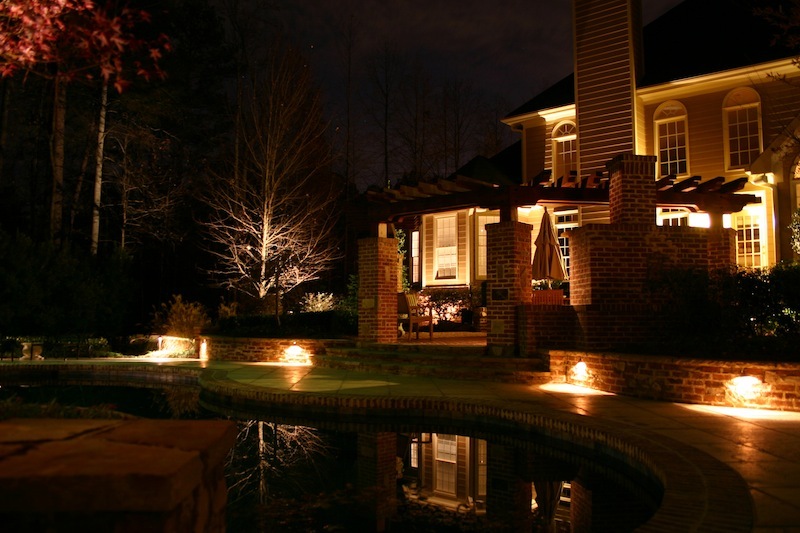 Creative, attractive landscape lighting can extend your entertainment into the wee hours of the morning, if you wish. Safety. Adding low-voltage lighting to your outdoor living space will add an element of safety for you and your family. Highlight your best features. Outdoor lighting can be strategically placed so that it highlights the best areas of your outdoor landscape. When properly designed and installed, an outdoor landscape lighting system will create an even glow of light that will softly highlight your home’s architecture and landscape in addition to providing functional use to living spaces. Outside Landscape Group will install a lighting system that demonstrates our ability to achieve the lighting effects desired by our clients, while considering the issues of cost, equipment performance, and site conditions. We look forward to working with you on all of your outdoor lighting needs, and assure you that we will provide your outdoor area with the highest quality lighting that will improve the look and functionality of your outdoor living space for years to come. Give us a call or contact us here to schedule your free consultation!